Off to Mlada Boleslav ... err, where? Ah, there it is, 30nm north-east of Prague. 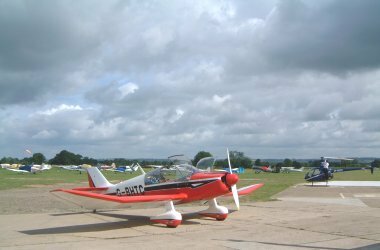 Graham's magic carpet Jodel 1051-M1 Sicile would take us to the airshow there, weather permitting. Sadly the weather gods only gave permission grudgingly, and not in full, but that did make for a good lesson in forecast interpretation and lots of navigation. 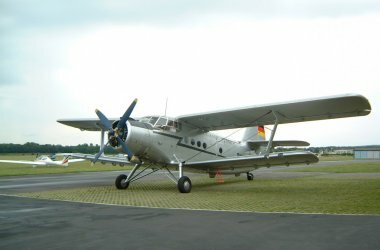 The air-show was being organised by a friend of Graham's, Vladimir Handlik, at the grass airfield near the Skoda car factory in Mlada Boleslav (LKMB), Czech Republic. 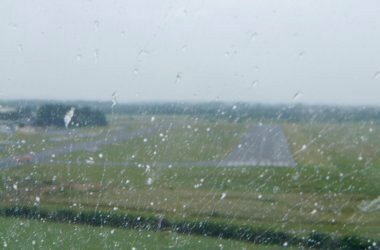 The plan was to leave on Thursday June 10th for an overnight stop at Bonn-Hangelar (EDKB), but TAfs and METARs said no, and so did a 'real-time weather' flight on Flight Sim 2004 (not to be used for operational purposes! ), so we met on Friday at Oaksey Park at 7.45am. This time the TAFs were a little more encouraging, so we loaded the back seat with the luggage and set off for Lashenden (EGKH), formerly Headcorn, north-west of Folkestone. 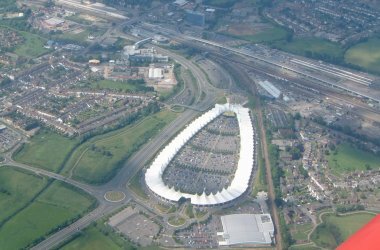 Swindon was easy to see, and so was Blackbushe, with Farnborough Radar giving flight information, while the OCK VOR was helping us stay clear of the London CTR. In any case, the M4 is visible from quite a distance and then the M3 and M25. Graham explained the IFR technique of navigation - I Follow Roads, Railways and Rivers. We sneaked round the edge of the Gatwick control zone, with help from some usefully-placed motorways and aimed for our re-fuelling and Customs landing at Lashenden (Headcorn), an 800m grass strip which, we discovered on our return, has an interesting museum containing excavated wartime aircraft parts well displayed and documented. It had taken almost exactly an hour to cover the 105 nm from Oaksey. With front and main tanks filled, flight plan and formalities arranged, and our lifejackets 'donned' we were off again for the next sector, heading for Bonn-Hangelar. It's not easy to get lost when the Channel coast is ahead of you, and the channel tunnel rail complex is alongside. A curious orthographic cloud was sitting over the Cliffs of Dover much as the 'table cloth' is said to do over Table Mountain, RSA. Now there's an idea for another time, Graham! 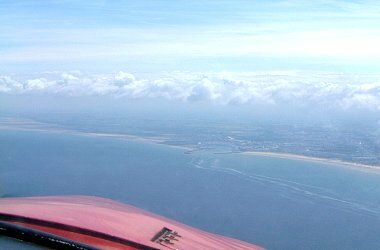 The French coast came in sight almost as soon as we were over the water and we headed in over Calais, meeting scattered strato-cumulus at about 3000 feet. 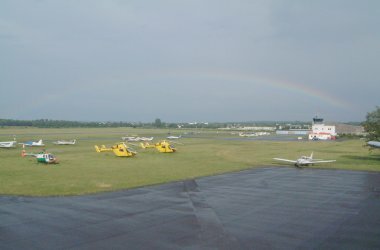 The cloudbase allowed us to maintain 2200 feet, which kept us clear of controlled airspace and was acceptable to ATC. 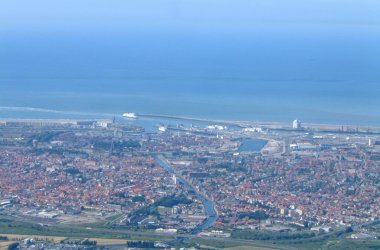 Just as with London and Gatwick CTRs, there's a gap to go through between Brussels and Charleroi, and contact with Lille Information and Liege radar helped keep us out of trouble. The Belgian chart wasn't the easiest to use for visual navigation, having relatively little orthographic information, but with Graham's local knowledge and roads, railways and towns, he was able to keep close to track. We diverted north-east in the Eifel Mountains to take advantage of clearer weather in the valley and save climbing into less certain conditions above the tops. 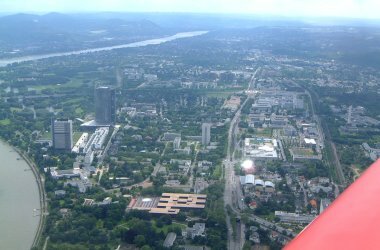 You can't miss Bonn as it sits on the Rhine, with Bonn-Hangelar, the original Bonn airport on the north-eastern edge of the city. The light rain showers returned for the approach and landing, but it was a welcome landfall for what we hoped would just be a transit stop. The 250 nm flight from England had taken 2hrs 20mins, an average speed of 107 knots with a little help from the light tail-wind. With the plane refuelled, and a new flight plan filed, we sat in the hanger of the Flying Club and waited for the departure time to come. 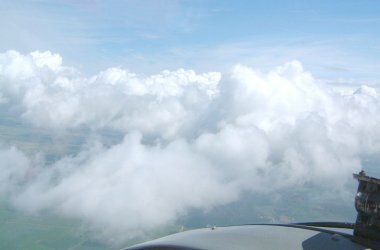 The met man phoned the club with bad news - "It is not possible to fly VFR to Karlovy Vary (LKKV) as the mountains will be obscured by low cloud and there are also thunderstorms. It will not be possible tomorrow either". Hmm, nothing for it but to stay overnight and see if the morning brought an improvement in the forecast. Saturday was the day of the air-show and Vladimir said we could be accepted until 12 noon local - at 3 hrs flying time, it would still be possible if the weather improved enough. Facilities in the clubroom were very comfortable; we used the club computer to check the weather forecasts; sat in the 'Eagle's Nest' in the hangar roof-space looking out over the field, drinking tea and eating flapjack. 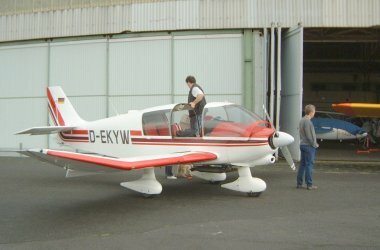 An old friend of Graham's from Bonn took us out for an evening meal, then it was sleeping bags and air beds on the floor for a good sleep after the very early start, with the Jodel safely tucked up in the adjacent hangar. The weather man was quite right - the next day was no better. 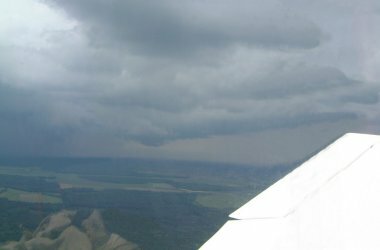 Though luckily the weather at Mlada Boleslav was fine for the airshow, it was still no-go in the mountains, and the options for an alternate on a 3hr flight in sparsely-populated country are few. So we checked the weather TAFs to the west, which showed nothing sinister, submitted a flight plan for Lashenden EGKH and waited to go. We set off for home at 0944Z, reached the Eifel range where a large thunderstorm with sheet lightning blocked our way. We diverted south-west in an attempt to skirt it, but it was clear that there were yet more beyond, so after 25 minutes we reversed course and returned to Hangelar, tucking the Jodel into the hangar again just in time to avoid the thunder-storm and torrential rain that hit the airfield. We whiled away the rest of the day watching the intrepid gliders using the thermals from the clouds, and studying the pcmet website to observe the weather radar and thunderstorm warnings. The radar animation on pcmet later that afternoon showed storms had been developing on the west side of the Eifel Mountains all day, streaming across towards Bonn - another good weather decision! Sunday morning was a lot better, with occasional showers but also splashes of blue sky, and the TAFs confirmed the improving conditions. Once up and past the Eifel range the murk had gone, and Belgium was spread out ahead with blue skies. 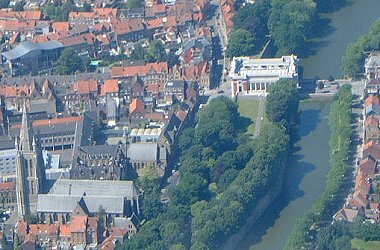 We flew past Ypres (Ieper), and Graham pointed out the Menin Gate by the canal, where the names of almost 55,000 British and Commonwealth soldiers of the First World War who were reported missing are inscribed. Then on past Popperinge, the rail head for the front line where troops could recover for a time before returning to the front and past Dunkirk back to the coast at Calais. 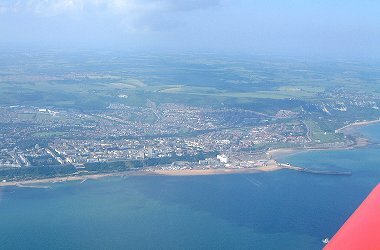 Then it was 'fingers crossed' and out over the channel to Lashenden via Folkestone and Ashford. 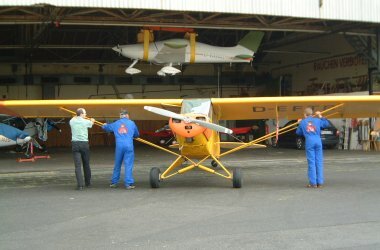 At Lashenden we refuelled again, filling both front and main tanks to save the landing fee, and set off for Oaksey Park. 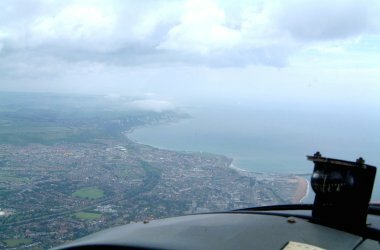 The weather over southern England was the best of the trip, and gave me a chance to take the controls. 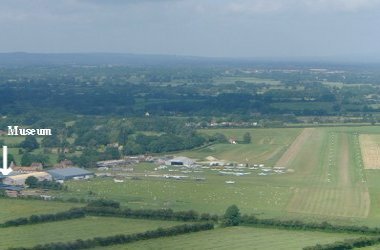 It seemed no time at all before Swindon appeared in the distance, and then the lakes of the Cotswold Water Park, but it was altogether about an hour's practice at maintaining course and altitude for cross-country flying. That and all the navigation and met. practice made for an interesting and enjoyable few days, during which the plane averaged about 100kts over the ground in the 8 hrs flown. It was a pity that the final goal eluded us this time, but as a learning experience it rated highly for me, with timely help for the next stage of my flying course, and Graham met up with several of his old flying club friends at Bonn. Sometimes my memory plays tricks, but I have a distinct impression that I heard Graham say something kind, or at least ambivalent, about GPS during the weekend. Maybe it's lucky I got some compass and map experience under my belt this time. © David Hall, June 2004.